How does late-night snacking get in the way of you achieving goals? For me, it was a matter of black and white, and I no longer find myself poking around in the pantry after everyone has gone to sleep. Find out how you can stop and why it will help you reach your health goals. I remember vividly how so many of my nights would go starting in my high school years and throughout my twenties. I was “good” all day long. No sweets. No extra snacking. Just the “good” foods that wouldn’t make me fat. I wouldn’t even really think about the treats and indulgences I was missing out on. And then everyone would go to sleep. Something about that “everyone’s asleep” mindset really got to me. I feel like maybe it set something off internally that said, “okay, you’re safe. No one’s watching you try to be perfect anymore. Have at it.” And so I did. Off to the kitchen to see what I could come up with. Usually it wasn’t the healthiest of foods, and it would basically ruin all the hard work I had done during the day. Does any of this sound familiar to you? I know a lot of people use night-time snacking to unwind from a bad day. The kids are finally asleep, so now you can relax in front of the tv with food that makes you feel better about your stresses. How does it make you feel though? I always felt guilty. I would be totally ashamed if someone had “caught” me going to get a snack at night. I’m not exactly sure why that is. Maybe because it would “blow my cover” and prove that I do actually have imperfections. It also always made me mad that I wasn’t strong enough to say no to the night-time indulgences and that I was hindering my chances of achieving goals I had made for myself. Why is it Getting in the Way of You Achieving Goals? If you have health goals (and chances are you do, if you’re here), night snacking can totally get in the way of you reaching them. Let me tell you why. * Night Snacking doesn’t give your body enough time to digest your food, so your body hangs onto it. * Night Snacking results in restless sleep, and we all know how important sleep is. * Night Snacking may make you feel guilty about your actions, which is not a great breeding ground for success. * Much of the time, night snacking can be very mindless. We are at the end of the day and we really just want to indulge without thinking. And that’s where we really get into trouble. So How do I Stop? You want to know how to break this habit of night snacking? Plan your meals. Plan your routine. And especially plan your evenings! If you have any kiddos, how many of you actually have an agenda for after they go to sleep? I don’t know about you, but when I was a new mama and wasn’t into planning my days like I am now, the time after my kiddo was asleep was complete FREE TIME. (ie, time for me to do whatever I wanted, like snack!) Or even if you don’t have kiddos, I think it’s a common situation where you eat dinner and clean up, and then after that, it’s kind of just fair game to do whatever, right? So make a plan. Keep yourself busy. Yes, you want to have time to relax. I totally get that. So plan it. Plan your tv time. Plan your reading time. Plan whatever it is. Write it down and stick to it. Of course you’re going to be looking for sweets as soon as the day has ended if you have spent the entire day saying no to them when you really wanted a little something. I personally have a piece of dark chocolate after lunch. This has helped satisfy my sweet tooth without feeling like I’ve lost control. Find the balance that works for you and makes you feel happy without feeling deprived or like you indulged too much. The truth of the matter is that if your body knows that you have allowed yourself to have whatever you want to eat at any time of the day or night, it’s not going to automatically crave the sweets and treats late at night. It’s going to spread those cravings way out. Throughout your days, weeks, and months. I hope you can see my vision here. I want you to be in a place where you are achieving your health goals and where food is not in control of you. You should get to be in charge of your life and your health. It’s all up to you on how you make that happen. If you want it, you may have to work a little harder for it. You may have to go through a couple of awkward weeks where you’re living your life to a rigid schedule. But in the long run, you will be so much happier and in control of what your life and your body is doing for you. Before you know it, you will be sleeping better, you’ll be happier with yourself because you won’t have the guilt, and you’ll be achieving health and fitness goals all over the place! And because I care so much about your success and truly want you to reach your goals, I have created a no-fail guide to success. This is a plan you can easily customize to your lifestyle. It can work for absolutely every person, so there should be no excuses. Go here now to find out more about this guide! Great post Holly! 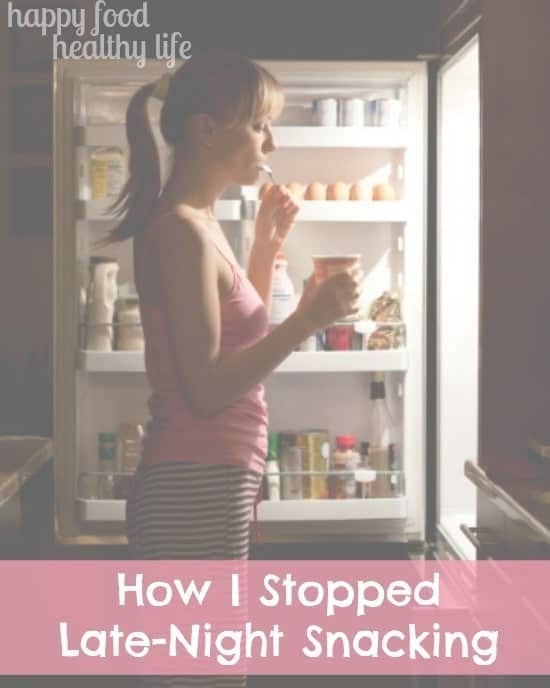 I can sooo relate to the late night snacking and I have set a rule for myself to stop eating after a certain time and I also allow for a snack…if there is no room left for one, I don’t get one. That’s a great rule that you’ve set for yourself. and also that you keep to it! Love this post Holly! I used to be a horrible late night snacker all through high school and college and even for several years after college. So I can definitely relate. Once I cleaned up my eating habits and started working out regularly it helped kick that habit. Really like your advice for planning out your evenings to prevent late night eating. It all boils down to discipline. I am also a late night snacker before and it was not good at all, then things started improving when I ceased from doing it and made sure I eat the right food at the right time. Thanks for the advice. I can relate it to especially the part about tending to eat less healthy things when no one else is around so that I seem “perfect” when others are there. I can guarantee you’re not the only one who feels that way Elizabeth. So many people want to appear to have everything under control regardless if that is the truth or not. Thanks for coming by! I never think about how I let food control me. I honestly haven’t minded letting food control me until recently. Thanks for the great article! I would be honored if you would come share it at Pin Your Friday Favorite. Thank you for stopping by, Jessica. It’s funny, but not many of us realize how much food takes control of our lives. We revolve outings around it. We revolve celebrations around it. We revolve our emotions around it even. It almost takes the enjoyment out of it! One thing I have tried that has helped with my sweet tooth is drinking Good Earth Sweet and Spicy herbal tea at night. I still eat sweets, but this honestly has helped. Good ideas. yes, tea at night is a great alternative to the sweets. great idea!